You know how the Post Office Guarranties Reliable Delivery of 99% of the mail? The slogan “neither snow, nor rain,” apparently didn’t apply to a U.S. postal letter carrier found with 20,000 pieces of undelivered mail in his home. Now I like to get mail as much, if not more than the next guy, thanks to Netflix and Amazon. But hoarding 20,000 pieces of mail? Yipes. On Monday, Burton pointed to former President George W. Bush's vacation habits to defend scattered criticism of Obama's August schedule. "As I recall, the previous president [took] quite a bit of vacation himself, and I don't think anyone bemoaned that," Burton said. Nope, Nobody, Not a one, no bemoaning whatsoever. This tiny coin is a bronze prutah of King Alexander Yanneus, one of the Hasmonean Kings of Judea who ruled from 103 BCE to 76 BCE after the time of the Maccabees, and a great-nephew of Judah Maccabee. Yanneus, in addition to being king was also first and foremost the High Priest. His reign is fraught with military conflict between Judea and external enemies as he expanded the size of the kingdom to about the size it was under King David, and he was allied with Cleopatra III of Egypt. Within Judaea his reign was marked by strife between the Pharisees and Sadducees within the kingdom. This coin is also famous for another reason as it is referred to as the "widows mite" in the Christian Bible. This is the first ancient coin I ever purchased. I bought it during my first visit ever to Israel at a reputable dealer when I was 15. I also bought two fakes in the bazaar..note to others when you go to an Arab bazaar, are young and have no idea what you're buying they will sell you fakes. Simply amazing to hold a piece of ancient history in your hand and I've been collecting ancient coins ever since. To think that the $15 I paid was a princely sum for me in my early teens, but to have a coin that was over two thousand years old was beyond price. It is in terrible condition but it is a wonderfully historic coin and it first put me on the road to collecting ancient coins. Here's an example of a better condition version of the same coin. It is rather fitting that a nation that is famous for wooden shoes was given a piece of petrified wood passed off as a moon rock. Thank goodness the prankster didn't give them a genuine Moon Tulip Bulb, or we could have had a real craze on our hands. Libyan Bomber's cancer diagnosis by a GP? Chalk up another win for both the British National Health Service and British Realpolitik. The furore over the release of the Lockerbie bomber intensified today over the medical advice given to the Scottish government on how long he has to live. It emerged that the prognosis that Abdel Baset Ali al-Megrahi had a life expectancy of only three months or less was supported by an unnamed doctor who had no expertise in terminal prostate cancer. The final report on al-Megrahi’s condition which went to Kenny MacAskill was drawn up by Dr Andrew Fraser, director of health and care with the Scottish Prison Service. Dr Fraser’s report, however, also contains a reference to the “opinion” of an unnamed doctor - thought to be a GP - who, says the report, “dealt with him (al-Megrahi) prior to, during and following the diagnosis of metastatic prostate cancer”. In other words, a doctor who was quite likely medically unqualified to give a diagnosis gave one that was awfully convenient in timing for releasing this terrorist and helping the UK with Libyan oil deals. Having underqualified doctors handle the diagnosis of cancer patients - so much for the superiority of British government healthcare. In the medical report are such gems such as Megrahi is not remorseful but "simply wishes to return home to be with his family, including his elderly mother," and he is feleing isolated religiously and culturally. Yes, really. Absolutely sickening. More importantly, it states that specialists when asked "Whether or not prognosis is more or less than 3 months, no specialist "would be willing to say" but then has the unknown doctor stating that the prognosis is 3 months (see page 2 of the report). By the time it reaches peak performance in 2011 the £30 million machine's massive processing power - it can perform 125 trillion calculations per second - will require 1.2 megawatts of power to run, enough energy to power a small town. As a result it will contribute 12,000 tonnes of carbon dioxide to the problem of global warming every year. That places the Met Office HQ close to the top of the list of carbon emitters - 103rd out of 28,259 UK public buildings assessed for their carbon footprint by the Department of Communities and Local Government. Oops, sometimes the cure is causing the disease I suppose. Lots of hand-wringing over a very useful computer. Barry Gromett, a Met Office spokesman, came to the defence of the machine, claiming that its severe weather warnings could help to save lives and its predictions for the airline industry helped to save 20 million tonnes of carbon emissions each year. He also defended the Met Office building. “Our supercomputer is vital for predictions of weather and climate change," said Mr Gromett. Isn't that defense merely "the ends justifying the means", or the watch while this one government project emits 12,000 tonnes (13,227 tons) of co2 per year while we wagle a finger at an ordinary US households that produce only 19 tons per year. In other words, this one computer center produces more CO2 per year than 696 American households every year. Bad enough that worries of carbon emissions are even being raised concerning this very useful installation, but it is even worse that carbon emissions and their unproven link to the unproven theory of global warming is serving to harm our economy as well. Last Sunday we took the kids to our annual visit to the Michigan Renaissance Fair. Held annually on the weekends in Holly, Michigan, this year from August 22nd through October 4th it is not to be missed. As you can see people really go all-out in their costumes and get into the spirit of the faire. The humor was quick and the adults got it and the kids in the audience didn't, being completely wowed by the juggling that was so skilled it looked like magic. This year because of a fair bit of rain it wasn't nearly as busy as it is normally and the kids were invited to have a fairy tea, which consisted of playing fairy chairs, singing some songs and having cupcakes and sierra mist with a bunch of friendly fairies. Very cool and they'll be at the Fair quite a lot this summer. The Fair of course would not be complete without the food - including the famous turkey legs that have to be tried to be believed, and a visit to the fair is simply incomplete without one. The Renaissance Fair is a great time for the whole family and you'll easily spend a great day enjoying yourself there. First please note if you will the biased headling the Detroit Free press assigns this incident - the permit holder "retaliated" by acting in self-defense according to the drafter of the headline at the Freep. No bias against CPL holders there, nope none at all. A 32-year-old suffered a graze wound to the head but seriously injured a 17-year-old trying to rob him at gunpoint in Detroit early today, according to police. The intended robbery victim, who has a permit to carry a weapon, pulled out his gun when he was confronted behind the apartment building at 1670 Oakman Blvd. near Linwood Street at 5 a.m. today, Detroit Police spokesman John Roach said. After an exchange of gunfire, the intended victim escaped with only the superficial wound. But the 17-year-old is in critical condition today in a local hospital after running away and collapsing in the parking lot of a gas station across the street, Roach said. Result: CPL Holder - 1 Mugger - 0. So much for the old canard that the criminal assailant will always win any armed encounter or just "take your gun away from you". Some people never learn: Renee Lashon Beavers of Detroit has had her license suspended not Nine Times but Forty-Five times (yes 45 times). Despite having her driver’s license suspended 45 times, a 33-year-old Detroit woman was arrested Tuesday in Ferndale driving a car that had been reported stolen, police said. Renee Lashon Beavers had a 24-ounce container of beer on her lap when a Ferndale Police officer spotted the stolen car eastbound on 8 Mile near Livernois just after midnight, Lt. William Wilson said today. Her license, which is currently revoked, has been suspended 45 times in Highland Park, Southfield and Detroit, according to investigators. Police expect to ask prosecutors to charge the woman with – again – driving with a suspended license as well as having an open container of alcohol in a car, Wilson said. Given that she's 33 years old her license has been suspended on average 2.5 times per year - every year that she has been eligible to drive! Anyone want to let us know who at the Secretary of State and who in the justice system let this slip by, and how she ever with that kind of driving record, ever had her license reinstated (yes it is now revoked but how about after time #33, 34, 35 and 36?) with these many suspensions? Further regarding this shining example of persons too stupid to drive - anyone want to bet she voted for Obama? A southeastern Michigan community will be doing its best Spokane, Wash., impression next month. That's when crews will be in Pontiac to shoot scenes for the upcoming remake of the classic 1980s film "Red Dawn." The city is about 20 miles north-northwest of Detroit. Downtown Development Authority director Sandy McDonald tells The Oakland Press filmmakers will be in Pontiac for two weeks at the end of September and a few days in October. The original "Red Dawn " portrayed a Soviet invasion of a small town in the U.S.
Had they wanted some more realism, and the benefit of a free-fire zone, not to mention the ability to blow up some abandoned buildings, they could have shot it in Detroit. Had they wanted real "Wolverines" they could have based the film in Ann Arbor, where the collective townsfolk would joyfully collaborate with their new communist overlords (We don't call Ann Arbor the Berkeley of the Midwest for nothing folks). But Pontiac looking like Spokane, Washington? Not so much, although with the weather we've been having we can probably arrange for some rain during the shooting. Pontiac as an invasion spot would be a pretty lousy choice. The invaders may very well get mugged in Pontiac, and unless the Arts, Beats and Eats Festival is going on they're going to get bored and sally forth pretty quickly for a more interesting and economically productive location. Now if the filmakers had wanted real Wolverines, along with an homage to the old film, they could have filmed it in Calumet, Michigan (The town in the original film was named Calumet). Those yoopers would give any invader hell and Calumet has that nice small-town classic feel to it. I'm not much for this constant stream of remakes coming out of Hollywood these days, which seems to be a result of a lack of original story ideas and compelling movies that people would actually want to watch. Red Dawn was a classic All-American action film. The remake with its revised invasion premise doesn't promise to come close, nor do today's circumstances resemble the state of the world in the 80s when the mighty Soviet Bear with its allies in South America and elsewhere around the world were on the march and a real worry. The remake seems to be about a Chinese invasion of the US (given the Chinese don't have near the power-projection ability the Soviets had in the 80s its a little far-fetched how this would work, never mind why they would want to invade their largest market for exports). There's no current American / Chinese military face-off like they was in Berlin or at the Fulda Gap of yore and relations are pretty cordial with China these days. Thus, I'm not having great expectations for this remake. I will also be really, really, annoyed if the American guerrilas in the film start shouting "Bulldogs!" instead of the classic Wolverines!. After banning guns, banning swords and thinking of banning all sharp pointy objects, the Brits now propose to ban - Fire Extinguishers. The Royal Society for the Prevention of Accidents backed their removal because different extinguishers should be used on different types of fire. Inflammable Albion, we hardly knew ye. hat tip - Commenters Joanna and Fast Richard at Tam's blog. I'm really not sure what a fish empathy center would entail, but suspect a lighthouse in Grand Haven is not the best place for it. People for the Ethical Treatment of Animals (PETA) has applied through a federal program to take over the structures and lighted catwalk that are frequently photographed for dramatic sunsets, thick winter ice and crashing waves. The area gets nearly 2 million annual visitors, including anglers casting lines into the Grand River channel and heading out in boats for Great Lakes salmon. "We want to renovate the Grand Haven lights as a memorial to the billions of fish killed annually by sport fishermen, as well as for their flesh (commercial fishing industry)," said Lindsey Rajt, manager of PETA's campaigns department. "We also want to make it a fun and educational place." Note to PETA: Fish are tasty, good for you and a decent source of protein. Tentative PETA plans call for an education center, where visitors would learn about fish. There also would be a cafe, offering vegetarian fare including "faux fish." Signs would likely announce the lighthouse as home of PETA's Fish Empathy Center. I assume this is just a ridiculous publicity stunt. We already have numerous places where people can learn about fish - acquariums or millions of dinner plates nationwide. After all what does one do in a Fish Empathy Center - do you get in the water and chant "glub, glub, glub"? These kinds of stunts further properly marginalize PETA as a voice of nothing more than lunacy and indeed self-parody. Locals are dumbfounded by the proposal. "It doesn't make any sense to me at all," Capt. Dan Tebo said Tuesday, a mile offshore in his Grand Haven-based fishing charter boat the D'Ann Marie. "We fish here for the fish. That's what God gave them to us for." Darn straight, and fish are even tastier when dipped in batter or grilled to taste. President Barack Obama chastised the defense industry and a freespending Congress on Monday for wasting tax dollars "with doctrine and weapons better suited to fight the Soviets on the plains of Europe than insurgents in the rugged terrain of Afghanistan." .... The president laid out a vision of a nimble, well-armed and multilingual fighting force of the future, not one that was built to fight land battles against the Soviets in Europe. "Because in the 21st century, military strength will be measured not only by the weapons our troops carry, but by the languages they speak and the cultures they understand," he said. Military strength in the age of Obama: the old liberal idea of "understanding" your enemies' culture. The whole idea currently in vogue of canceling useful weapons vital to fighting conventional warfare just because they don't fit an anti-insurgency model we're currently fighting is extremely shortsighted and may bite us when we need them most. There's no guarantee that wars and conflicts of the future will all be insurgent conflicts - indeed some of America's leading antagonists - North Korea (US forces protecting South Korea from an invasion from the north), Iran (conventional Iranian invasion of Iraq to "protect" the Shiites in Iraq once US forces further are drawn down), China (say the US gets drawn into defending Taiwan from a Chinese invasion), all have very large conventional forces that would roll over a military focused solely on low-intensity conflict with ease. Indeed, both Afghanistan and Iraq began with Conventional US forces doing the brunt of the fighting, not civil affairs and nation building exercises. Even worse is this new push for a touchy-feely nation building army along the lines of the Peace Corps. While civil affairs units are very useful, front line combat troops really shouldn't be used for that job, nor do all the troops need to know the local language or appreciate what are often very backward cultures with morals and values antithetical to our own. August 16: Obama Backs Away from the "Public Option"
As President Obama finishes a western swing intended to bolster support for his signature policy initiative, Health and Human Services Secretary Kathleen Sebelius opened the door to a compromise on a public option, saying it is "not the essential element" of comprehensive reform. White House press secretary Robert Gibbs said on CBS's "Face the Nation" that Obama "will be satisfied" if the private insurance market has "choice and competition." August 18: Obama goes forth, not backing off from "Public Option"
White House spokesman Robert Gibbs insists the Obama administration has not shifted its goals on health care reform or distanced itself from a government-run public insurance option. He said in a meeting with reporters Tuesday morning that news stories suggesting that the administration was ready to abandon the public option as it battles to push health care reform through were overblown. The rash of reports began after Health and Human Services Secretary Kathleen Sebelius (seh-BEEL'-yuhs) appeared to signal the president was open to health care cooperatives as an alternative. Gibbs said there was no intention to indicate a change in policy. He said, "If it was a signal, it was a dog whistle we started blowing weeks ago." Was the dog whistle the White House has been blowing a signal to the lapdog media to roll over and beg and not ask what is this administration up to, and does it even know what it is doing? Michigan tart cherry growers say they're preparing to let up to a quarter of this year's bumper crop rot on the ground under a federal marketing order, and some say they'll shift into more profitable wine grape production. The order will divert 42 percent of the nation's about 300 million-pound tart cherry harvest this year. Growers in the Grand Traverse Bay area estimate they'll abandon 20 to 25 percent of their crop. Some producers are unhappy about the dumping, and grower Leonard Ligon made his feelings known by dumping his 72,000 pounds of cherries along a road in Grand Traverse County's Peninsula Township. New York, Oregon, Pennsylvania, Utah, Washington and Wisconsin are the other major producers. Just led food go to waste as part of the boondoggle we have with agriculture in this country. Too bad, tart cherries are good eating. During our anual dive trip, we also managed to get in a little shooting and observe a little driver stupidity. As usual, we went to the famed Lapeer Pit for our shooting excursion. On arrival, again as usual, some shooters were already present - two guys and one girl. In addition a fellow showed up shortly thereafter and all he did was walk around the range with a bucket and a claw on a pole and picked up brass that was on the ground -much strangeness and a little creepy as he'd sit in his truck, wait for a cease fire then wander around with the claw and bucket). But it is the activites of the two guys and a girl that earn them the title of goobers. When we pulled up they were bump firing an AK clone and not hitting squat. Of course on getting out we observed them to be bump firing with the aid of a rubber band which is a no-no -> see the ATF letter rulings on use of a shoe string to do the same thing. They were kindly requested to cut it out and not use any such item. The girl then piped up that bump-firing is legal - yes it is, but you can't use any device to do so. Is this a dumb rule? Yes. Is it the law? Yes. Does either myself or LK want to be anywhere near some goober doing something illegal with firearms in public? Hell NO. So they cut it out and just went to bump firing without it. To say they were inaccurate with their bump firing would be an understatement. They had a toilet seat set up less than 5 yards from the firing point and of course, on bump fire the girl didn't even hit it even once. The boys were't all that much better and they occaisionally hit a computer about the same 5 yards out. The ground of course was wounded by repeated bullet strikes. So much for "assault weapons" being designed to be fired accurately from the hip. For an encore as she turns with the AK she lets of a shot that goes into the woods to her right beside her and outside the berm. Nice. To top it off, they opened a case and gave the girl a beautiful bolt action tactical rifle to try. It looked like a Remington 700 PSS from afar - a very nice rifle. There were neither sights nor a scope mounted to that rifle. Think about it, a very expensive, precision bolt action rifle designed to have a scope mounted and aimed and fired with the use of scope DID NOT HAVE ONE. It was to either weep or laugh, so we just rolled our eyes in disbelief. I daresay this bunch would give Tam's lowest common denominator shooters a run for their money. After these comedic feats of arms they left. All the while they're missing, we're hitting targets out to 100 yards with pistols and rifles, including using my semi AK clone (from the shoulder and using the sights mind you) to squarely hit small targets at 100 yards one trigger squeeze at a time. So we finished our shooting as the weather started rolling in and then cleaned up and packed up and left. On Sunday, as we returned from the dive along Highway 94 we got to experience one of Michigan's more lovely construction zones, complete with a lane shut down. Of course with the signs saying the left lane is ending, the Goobers all stay in the left lane untill the last minute then push their way in, causing traffic that got over early to have to stop and let them in. This of course disrupts the flow of traffic nicely as everyone has to brake to let them in so they can save a few car lenghts. One Red Ford Expedition was driving thusly, staying in the left lane and not getting over. Quite oblivious to all and sundry, with his significant other having her hand and cigarette dangling from the passenger window to add to the carefree ambiance. Less than a few minutes after the picture was taken, the driver of the Expedition in the picture above decides to pass a tow truck as the construction zone proper beigns and the left lane closes by moving onto the left shoulder and pushing through while under the bridge that you can see in the picture. He miscalculates and hits the tow truck on the driver's side. The Expedition doesn't stop but keeps on going, leaving the scene of the accident. The tow truck pursues but can't keep up with the Expedition weaving in and out of traffic. We catch up to the tow truck, let him know we saw it and give him our info. It should be interesting to see the claim that comes out of that one. To recap - lagging in the left lane in a construction zone instead of getting over right before the complete shut down of the left lane is stupid, colliding with a tow truck while doing so is even dumber. Hopefully his insurance bill wil be instructive on that point. On Sunday we slept in somewhat, no thanks to the noisy neighbors at the campsite. between the drunken louts at night in the RV section of the campsite that could be heard over the hill that separated them from the tents, and the yelling moms and kids in the tent area, sleep was hard to come by. The Canadian Shipping Lines Regina, a 250 foot long freighter sank in the Great Storm of 1913, taking all her crew with her. The Regina which I had dove twice before but I was about to be in for a new experience. On both prior dives we had gone down on the stern, and this time we were heading down on the bow, which I had not yet seen. Now remember kids don't drink and dive! The bow of the Regina was a nice dive. I even managed to get LK to start regularly monitoring his pressure gauge. One quick note - having 1800 PSI remaining does not mean keep on swimming away from the upline towards the stern of the ship, it means hang around as you're going to turn the dive at 1500 psi and head back towards the upline, not wait until you have to make a mad dash for the upline, and certainly not leaving your buddy behind to follow the blooming trail of silt you leave in your wake. Ah, some dive buddies. We then dove on the Eliza Strong, the first time i had ever dove this wreck. 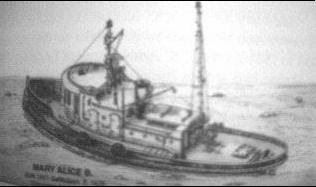 The Eliza Strong was a 205' wood steamer, sunk in 25 ft of water in 1904. The wreck burned to the waterline, was dynamited as a hazard to navigation and is a nice relaxing dive. We had a bottom time of 54 minutes cruising along the hull and around it looking at the wreckage that was everywhere. The conditions for the dive could not have been any better - excellent visibility, low amounts of particulate in the water and warm temperatures (for the Great Lakes anyways). The Strong was a great dive! Every Year, Lagniappe's Keeper (LK for short) and I get together for a Great Lakes Dive Weekend. This time instead of one charter we decided to do two for a total of four different shipwrecks in two days. As usual we signed up with charters being run on Captain Gary Venet's boat Sylvia Anne of Rec and Tec dive charters - as always a great boat to go out diving on the Great Lakes. We left my place on Friday and drove up near Port Sanilac to camp out. We met up with Amy, a diving friend of LK's from Minnesota. Unfortunately she got lost around Lansing, diverting from Highway 69 onto Highway 96 and ending up near Detroit before getting reoriented in the right direction. So we got together, got our tents setup and went into town for dinner and turned in relatively early in preparation for our dives to start early Saturday morning. The dives for Saturday were the North Star and the Mary Alice B. 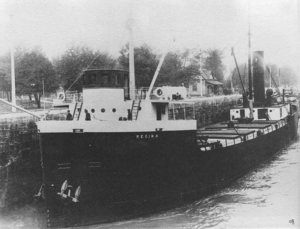 The North Star was a 300' long steal propeller driven freighter. The North Star sank on November 25 1908 after being rammed by her sister ship the Northern Queen with no lives lost and is resting in 96 feet of water. The ship is broken in two and is lying on the bottom on its side. As before, we went down the line on the stern. Conditions were somewhat better than the last time we dove her and it was a nice wreck to see. We made an uneventful ascent and had a surface interval before diving the Mary Alice B. 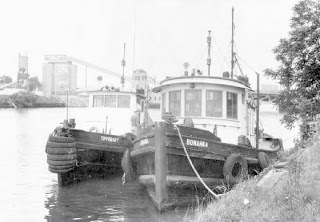 The Mary Alice B was a tugboat that sank in 1975 just a few months before the famed Wreck of The Edmund Fitzgerald. It rests in 92 feet of water and access is possible to the pilot house and the engine room (the roof of the engine room has been ripped off so egress is quite simple). It was fun to float in and turn the ship's wheel, which moves quite freely and look out at the lake beyond. The Mary Alice B when she was named the Bonanka (The letters are starting to show underwater under the Mary Alice B's name now that divers have been rubbing the area on the bow where the name is to see it). As you can see there was a lot of particulate in the water and visibility wasn't perfect, but it was decent enough. Once I'm done editing the movie footage I'll add some to this post as it is much more clear than the photos. After the dive we returned to the campsite and then went to the Lapeer Pit for a little shooting (and watching some seriously goofy shooters what Tam would call far below your Lowest Common Denominator Shooters - more on them and some other goofballs we encountered during this trip later) and then we made dinner at the campsite by grilling some brats and toasting our diving success with some nice cold beer and then to sleep to prepare for Sunday's dives.